"Could you please help? I'll give you five percent of the profit!" 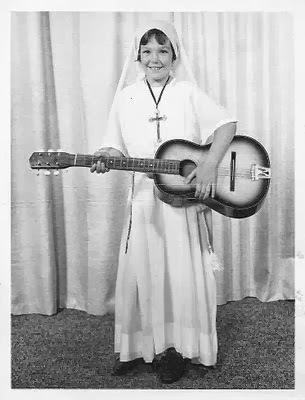 Sister Bertrille (Sally Field), The Singing Nun, 1967-1970. I reckon Sister George from Where Angels Go, Trouble Follows (along with its prequel, The Trouble With Angels , one of my all-time favourite flicks) could've worn something very similar to this Gala Travelon linen frock. It has something of the uniform about it. I love the little box pleats and brown top-stitching detail though. Perhaps you think I'm talking out of my hymn book with all this Nun stuff, but after all, I've got a bit of a thing for them...Remember? "The Flying Nun", "The Singing Nun", Audrey Hepburn in "The Nun's Story", Rosalind Russell in the flicks I mentioned above, I loved them all! And I love you too, for your generous support and sponsorship. $1110.50! for research into ovarian cancer. If that's not awesome, I don't know what is! Today thank you's go out to: Terry and Maryse (my lovely in-laws), Tam (who doesn't write her blog anymore, but you can check her beautiful stamp jewellery here), Emmah, and her lovely Mum Gaye, Max, Claire, Daisy and Nelly. I'd love to add your name to the list. Please sponsor me Here. It would be terrific if you could. Thanks for reading, sponsoring me, and spreading the word. Sister Kylie, love it! 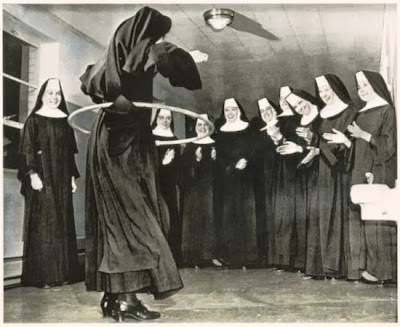 Now let's see some hoola hoop, action! 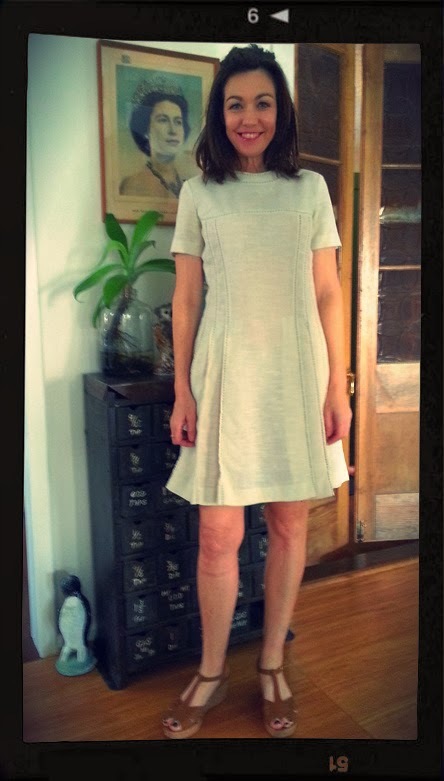 Cute frock, very demure, even with the knees. What ARE you on about, you have amazing legs, I'd get 'em out all the time if I had those pins! Great shoes. Even greater total. Aww you're so cute, Kylie - then and now. I love your sandals btw. 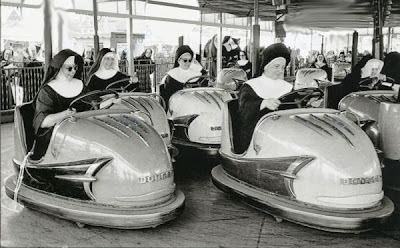 Oh God, nuns......I went to the Convent of theSacred Heart High school - it was full of them. Sr Bunbury was the spectacularly scary , mustachioed headmistress *shudder*. Sorry, Kylie, I digress big time! Now the Nun's Story - that's one of my favourites. Yay. I just popped in and I love your frock posts. You look fabulous in all of them and make it look like so much fun! Plus, you've raised so much money ... well done. You gorgeous thing I love it. 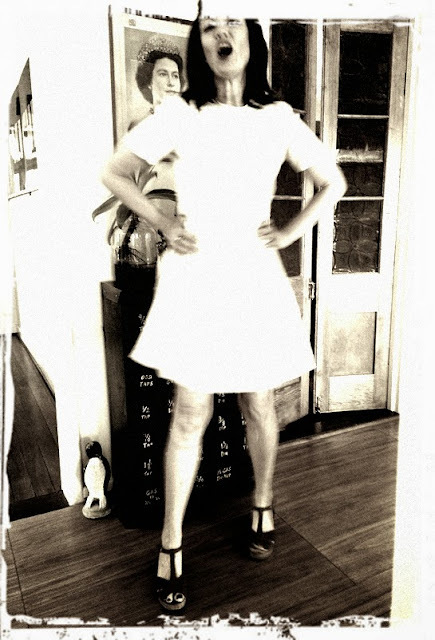 I'm with pastcaring...I inherited tree trunk legs from my mom's side of the family and always dreamed of having legs like yours! The dress is so cute. When I first saw it, it reminded me of a dress I had back in the late 60s. Congratulations on already passing your goal. What you're doing in so wonderful. Gorgeous, although the Queen doesn't look impressed, I am. ... I wouldn't have the Solid Gold Dancers screaming 'MA-UM' every five seconds. I too am enjoying the backdrops of you home. Ovarian cancer be gone!! hee hee, schwung that, nunnie. The hipster nun thing totally works for you!